Whitaker, the larger Male, is 1 1/2 years old. He loves to be a complete goofball and make people smile. He really loves his big, but smaller, sissy Amelia. She is a 5 year old female. She definitely has the brains of the family! She loves figuring things out and tricking her little brother into giving her his toys. 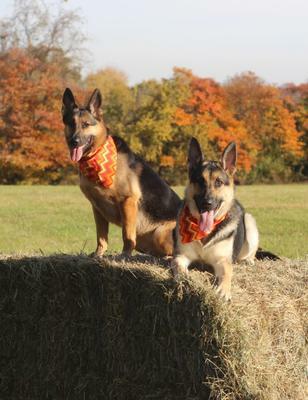 These two are both one of a kind, crazy, loving German Shepherd!